QMed was invited to deliver a lecture on Literature Search and one on the Reference Management tool – Mendeley at a workshop organized by the Journal of Clinical Ophthalmology & Research and the Indian Journal of Ophthalmology conducted at the PD Hinduja National Hosiptal, Mumbai on 10th May 2013. Participants included doctors from various parts of India; in fact three participants had come from Nepal. 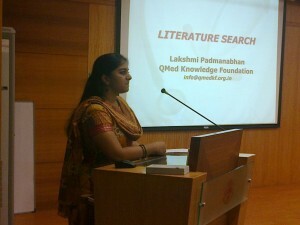 Lakshmi Padmanabhan from QMed delivered the lecture on Literature Search which covered five basic tips of searching and an introduction to The Cochrane Library. It was one of the few Research Methodology Workshops which began with a session on literature search. Ideally it ought to be that way because Literature Search is the foundation of any research activity. Q1: Can we use the same search techniques in Google as well? QMed: Yes you can, to an extent. The principles are the same, but the commands may be different. And Google has limited features for searching. Q2: What are the other databases that we can search? QMed: Depending on what kind of information you are looking for you could search -Google Scholar, Medknow, DOAJ and more. But do remember there will be lots of duplication. Q3: Why are you only covering PubMed? QMed: It forms an excellent basis to learn, it is free to search and covers a lot. Once you learn this, you can apply the searching theories to most databases. Q4: Can we use Google to know which other databases are available? QMed: It is easy to search the website of a known database, using Google. But to know about all existing databases, it may be as difficult as finding any other information you normally look for. Q5: After learning about Cochrane Library I think I can find everything there and I don’t need PubMed? QMed: The information contained in both the resources is different so in no way can they be compared. PubMed provides a bibliographic record of journal articles while Cochrane Reviews are systematic reviews that have been done by analyzing various RCTs and existing studies. Cochrane Library has six databases. Some of the content is not covered in PubMed and some of PubMed’s content is not covered in Cochrane. So depending on your information needs, you will need to search both at some point. Q6: Why do we need to use the Single Citation Matcher (SCM) in PubMed when we can directly go to the journal website and check the availability of an article or verify an incorrect/incomplete reference? QMed: It is far easier to locate an article through SCM, if you learn and practice the right techniques. The participants were highly motivated and inclined towards Research. The questions and the interest to learn everything related to literature search in that short duration was a testimony to that. In the tea break that followed many participants expressed an interest to invite us to their respective institutions for detailed workshops. The session on Mendeley was also well appreciated and it had its set of questions and learnings. This session was followed by a group activity where participants did some basic exercises on searching and verifying references in PubMed based on the tips covered in the lecture. One doctor from Delhi gave a feedback that “till date I used to just type something in the search box and get so many irrelevant results that I would give up on searching. But not anymore, those tips will help me. I will ask the Medical Education Unit of our college to invite QMed for a detailed workshop”. It was a great experience to interact with such enthusiastic participants from all over India. This entry was posted in 6 - Old posts and tagged Cochrane Library, Hinduja Hospital, IJO, JCOR, Mendeley, PubMed. Bookmark the permalink.